Andropogon gerardii is a dominant grass in the tallgrass prairie in North America. This species is a perennial, warm-season bunchgrass. Perennial. Plants grow and resprout from clumps. Reproduction. A. gerardii reproduces both by seed and rhizomatously. Unusual seed dispersal. The fruits may be able to travel along the ground with a hygroscopic awn, with the daily fluctuation of humidity. Wind pollinated. Like other grasses, A. gerardii is pollinated through the wind. Phenology. 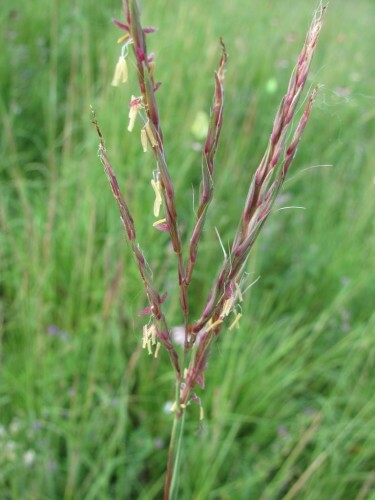 A. gerardii, a warm-season grass, tends to flower in mid July, with seeds ripening in late summer. The USDA plant profile page for Andropogon gerardii.